POSTED January 31, 2019 10:42 a.m.
CASSVILLE — Cassville sophomore Anna Kartman continued her mid-season surge Saturday on her home court. 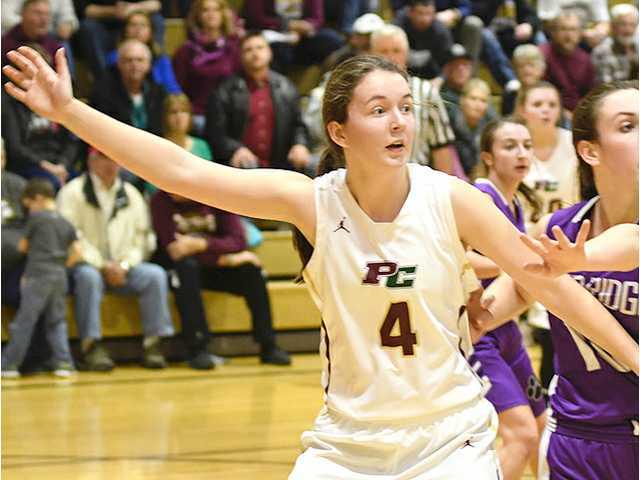 Kartman posted her seventh double–double of the season and sixth in her last seven games to lead the Potosi/Cassville co-op to a 51–41 non-conference victory over Fennimore in a makeup game Saturday afternoon at CHS. Kartman finished with a game-high 16 points and a game-high 14 rebounds to power the Chieftains (9–5) to their ninth victory of the season. Senior Amber Udelhoven scored 10 points and grabbed six rebounds, and sophomore Lilly Post added eight points and 11 boards for the Chieftains, who outscored the Golden Eagles 27–14 in the first half. Fennimore (5–11) was coming off a huge 53–52 upset of SWAL co-leading Cuba City (11–4, 7–2 SWAL) a night earlier. Senior Ashley Lang scored a team-high 14 points to pace coach Kevin Everson’s Eagles. Last Monday night, coach Brad Bierman’s Chieftains couldn’t overcome a 37–23 first-half deficit in a 60–47 non-conference loss at Argyle. Jena Saalsaa made 7 of 10 free throw attempts and three 3-pointers to lead the Orioles (11–2) with a game-high 22 points. Alysabeth Lantz added 18 points. Sophomore guard Justice Udelhofen led the Chieftains with 12 points and three steals. Kartman recorded a double–double of 10 points and 11 rebounds. She is averaging 10.3 points and 9 rebounds per game (both second on the team), including 13.3 points and 11.1 rebounds over the past seven games. The Chieftains are 5–2 during that stretch. The Potosi/Cassville will now travel to league-leading River Ridge (13–2, 6–0) Friday night for a 7:30 p.m. tip-off. The Chieftains will then host Belleville (11–4) in a non-conference game on Saturday afternoon at 2:30 p.m. before traveling to Juda (2–13) Monday night. Fennimore (5–11) — Alexis Adkins 6, Brynlee Nelson 9, Claire Faulkner 9, Drehya Dresen 3, Ashley Lang 14. Totals – 41. Potosi/Cassville (9–5) — Lilly Post 8, Justice Udelhofen 8, Anna Kartman 16, Brittany Horner 5, Lydia Reynolds 1, Jessica Noonan 2, Amber Udelhoven 10, Sydney Fecht 1. Totals – 14 19-34 51. 3-point goals — F: n/a, P/C: 4 (Post 1, Udelhofen 1, Horner 1, Udelhoven 1). Total fouls — F: n/a, P/C: n/a. Fouled out — none. Potosi/Cassville (8–5) — Lilly Post 6, Justice Udelhofen 12, Anna Kartman 10, Lydia Reynolds 5, Marissa Mayers 3, Amber Udelhoven 7, Sydney Fecht 4. Totals – 16 12-22 47. Argyle (11–2) — Lexi Leigh 2, Kirsten Ostby 11, Victoria Lantz 7, Alysabeth Lantz 18, Jen Saalsaa 22. Totals – 21 10-17 60. 3-point goals — P/C: n/a, A: 8 (Ostby 3, V. Lantz 2, Saalsaa 3). Total fouls — P/C: n/a, A: n/a. Fouled out — none.